Exposure integrates with AAU's Membership information and can validate coach and player rosters for a team and at registration. To enable full functionality follow the steps below. Before activating any AAU functionality the AAU Licensed # must be available and turned on with the steps below. The team AAU Club Code and coach/player AAU Membership ID fields are hidden until the event is enabled as an AAU Licensed event, and visible afterwards but optional. If you want to make these fields required for the team, coach, and player they need to be enabled under the Edit Team Fields and Edit Player Fields under the Registration section of the Event Settings page. Under Edit Team Fields, add AAU Club Code and Primary Contact AAU Membership ID and make them required or hidden. Under Edit Player Fields, add AAU Membership ID and make it required or hidden. This will also enable the fields under Coach Accounts where teams might already exist. Directors and coaches can still add players the manual way but can now use our AAU Lookup interface for AAU Licensed event rosters. For existing coaches or players on a roster, a similar input is available. Team, coach and player tables will now show a new column once an event is enabled as AAU Licensed. This column may contain three icons and are explained below. 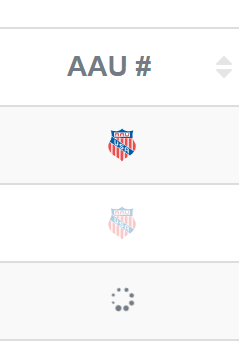 Transparent AAU Logo - Team, coach or player is NOT verified or is expired. For Directors, enabling an event as AAU Licensed shows a new report called AAU Rosters that is AAU themed under the Event Reports. For Coaches with a Coach Account there are a few reports to view for an event. They can be found under the Teams section of their Coach Account. The event listed for the team will show a Printable Team Roster and a Team Scores-sheet that is blank and another that contains their schedules.